Picking a leader should be about assessing the experience and skills an individual can bring to the table, but a new study finds that getting ahead may be easier for people with the right facial features. In a study published in The Leadership Quarterly, psychological scientists from Carnegie Mellon University, Warwick Business School, and West Point Military Academy found that people were surprisingly good at matching leaders’ faces to their real professions. Study authors Christopher Y. Olivola, Dawn L. Eubanks, and Jeffrey B. Lovelace suggest that we may be choosing leaders, at least in part, based on unconscious biases towards certain facial features. In one experiment, 614 British individuals were presented with a series of black and white photos of unfamiliar American leaders from various professions including business, the military, government, and sports. The photo sets were made up of headshots of CEOs from the 500 largest US companies, US Army generals, US state governors elected between 1996 and 2006, and professional and college football coaches. Each photo was cropped and standardized so that only the face of the individual was shown, and only photos of Caucasian males were included. Any highly recognizable faces were removed from the sample. Participants were assigned a target category—say, football coaches—and each trial they had to choose which of two faces they thought was the football coach. They then rated how confident they were about the accuracy of their guess on a 0–100% scale. Although people didn’t have much confidence in their guesses, they were significantly better than chance at matching leaders to their actual professions merely by looking at their face. Participants were generally successful at picking out business leaders, military leaders, and sports leaders. However, this ability did not extend to politicians; when participants were asked to identify political leaders, their accuracy was no better than chance. To find out whether there are particular facial characteristics that people associate with different kinds of leaders, the researchers ran a second experiment. A new set of 929 British participants was asked to rate 80 of the leaders’ faces on 15 dimensions, such as trustworthiness, masculinity, and likability. 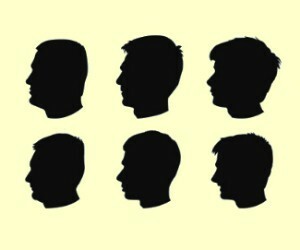 In each trial, participants were shown a single face and asked to rate each face using a sliding scale for a single dimension. So some participants only rated faces for trustworthiness, while other participants only rated faces on attractiveness. Sure enough, the researchers found that leaders from particular professions tended to have facial features in common: Army generals and football coaches were rated as having more masculine faces, while politicians and CEOs had higher ratings for warmth and competence. The researchers caution that just because a face may receive high ratings for a characteristic like warmth or competence does not mean that the person is actually trustworthy or competent. Instead, these ratings suggest that people may be choosing leaders in part because of stereotypes and biases towards certain traits.